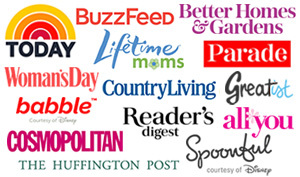 Disclosure: this post is supported by affiliate links. Mashed potatoes are one of my top favorite foods. Big surprise, right? I mean, I know I’m not the only one. They are a total comfort food for me. I’m also not picky on how I have them. A touch of butter and some salt and pepper is very nice. Adding some roasted garlic and cheese is extra nice. As a teen, one of my favorite lunches was some instant mashed potatoes. If we had cheese slices, I would cook up the potatoes and press a slice of cheese on top and let is sit for a few minutes so it would semi-melt. Then I would mix it all into the potatoes. Of course, this worked well too if there was some leftover mashed potatoes in the fridge, but that was less common. 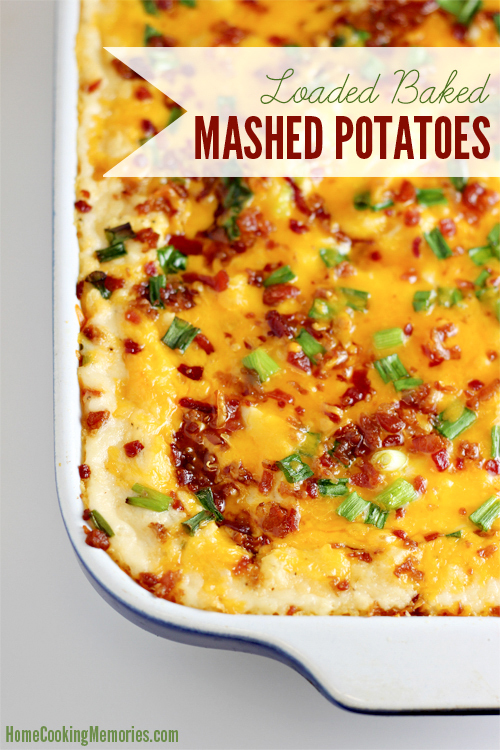 These Loaded Baked Mashed Potatoes are my way yummier version of my teenage lunch. This isn’t health food…if you want that, you’ll want to move along. Loaded means loaded with delicious goodness like butter, cream cheese, and sour cream. We don’t have this side dish very often, but when we do it’s a special occasion. Everyone goes crazy for it. While I love the cheese and all, I think the star of this mashed potato side dish is the roasted garlic. I’m so crazy about roasted garlic and even my former garlic-hating husband loves it. The potatoes, garlic, cheese, sour cream, butter, and cream cheese are all mashed up together, placed in a baking dish, and topped with more Cheddar cheese. Oh, and I have to share my love of my azure blue Emile Henry casserole pan. I love it so much. I won it back in 2010 in a blog giveaway on La Fuji Mama’s blog. Back then, I had never even heard of Emile Henry cookware, but now? I’m a total fan. It’s so durable, easy to clean, and everything bakes beautifully in it. 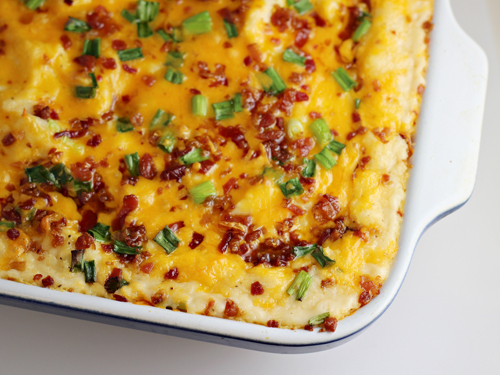 Ok, back to the Loaded Baked Mashed Potatoes recipe — if you are feeling crazy, you can also top with some bacon and sliced green onions like I do. It’s baked in the oven until perfection. 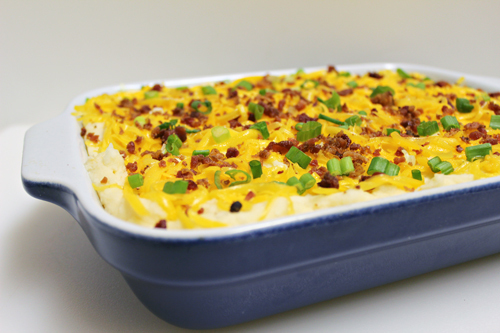 Here is the full recipe for this Loaded Baked Mashed Potatoes recipe, all ready for you to print. Not ready for it yet? Be sure to save it to one of your Pinterest boards for safe keeping. Place potatoes in a large pot, cover with water, and bring to a boil over high heat. Reduce heat to medium and simmer until potatoes are tender. Drain well and return potatoes to pot. Preheat oven to 400 degrees F. Cut off the top quarter of the garlic head and set garlic head, cut side up, on top of a piece of foil that is large enough to wrap around the entire garlic head. Drizzle the top (cut area) with olive oil. Wrap foil around the garlic head. Bake for 35-40 minutes or until the garlic cloves are very tender and soft. Carefully unwrap garlic head. Squeeze out roasted garlic or use a small knife tip or fork to “pop” out the cloves. Set aside roasted garlic and discard skins. With a potato masher, mash potatoes well. Then mash in the butter, cream cheese, sour cream, roasted garlic, and 2 cups of Cheddar cheese until all ingredients are combined with the potatoes. If needed, mix in some milk to ensure that the mixture is smooth and creamy. Season with salt and pepper to taste. Spray a baking dish (approx 13×9″) with cooking spray. Preheat oven to 350 degrees F. Spoon loaded mashed potatoes into baking dish. Top with remaining Cheddar cheese. If desired, top with sliced green onions and bacon. Cover with foil and bake for about 15-20 minutes. 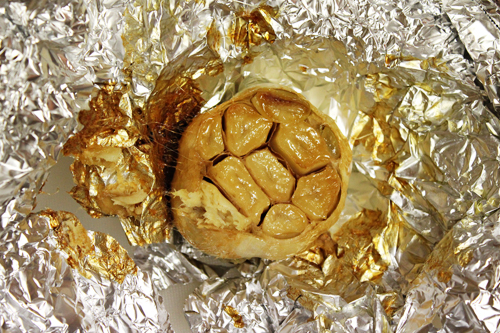 Remove foil and continue baking until cheese is melted and top begins to brown. Talk about delicious! I have never heard of this dish until December 2017. While living in Jordan Montana back then. My boss had a Christmas party at his ranch and his girlfriend made this dish. I’ve been looking for this recipe and now I’ve found it! You are awesome! Thank you! We made these for Thanksgiving this year, and they were amazing! They are definitely on the list for Christmas dinner too. Thank you so much. This looks incredible! I’m always looking for new side dishes to add into the rotation especially when it comes to holiday gatherings. I think this is what I’ve been looking for! A family favorite now!!! Thank you!! I made 3 pans for our Easter today!!! A labor of love but so worth it!!! There’s no way this uses two whole heads of roasted garlic. Do you mean two cloves?? Two heads would be extremely too much garlic! Yes, the recipe is correct. It uses 2 heads of garlic, not 2 cloves of garlic (which would be hardly noticeable with 5 pounds of potatoes). You’re welcome to reduce the garlic if you would prefer less. 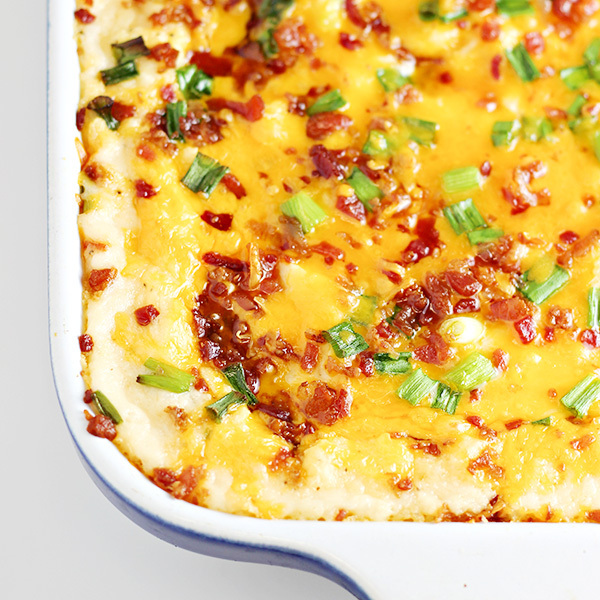 Your Loaded Baked Mashed Potatoes look fabulous! Thanks so much for sharing your awesome post with Full Plate Thursday and hope you are having a great day! Brandie, what a coincidence! I was just over at Inside BruCrew linking up to her party, and saw these potatoes featured and my jaw dropped because they look SO GOOD. I looked to see what blog they were from, and saw that it was your blog that you just told me about on our Hangout today! Too funny! These look incredible! I sooo wish I had them in front of me right now instead of a boring ol’ hamburger. Hi Sarah! That is funny…glad you found me! It was great meeting you today! This looks AMAZING. I love mashed potatoes, but getting the garlic right is tricky. Seriously, these look so, so good… and now I’m starving. LOL Pinning this one! OMG this looks delicious! I can’t wait to try it – my husband sends his thanks in advance! These mashed potatoes look absolutely delicious! It’s almost 10 at night and I want to go and make some now. I don’t know why it’s never occurred to me to make this. I loved loaded mashed potatoes! I love this recipe, but am not a big fan of having to roast the garlic (I hate the smell). Is there anyway I could substitute it? looks amazing! how many will it serve? This looks amazing! Do you think it would work to put it together a day ahead and bake it the day you want it? Thanks Caryn! And yes, it’s good to make the day before, refrigerate, and then bake the next day. I need this on my menu this week! Thanks for linking up with Whats’ Cookin’ Wednesday! Your Loaded Baked Mashed Potatoes look wonderful, we will just love them. Thanks so much for sharing your great recipe with Full Plate Thursday and enjoy your Thanksgiving week! This sounds so delicious! I love mashed potatoes, too! I found this on the Thrifty Thursday linkup. So glad I did! 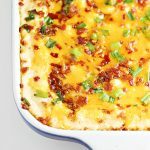 You can never go wrong with mashed potatoes, but add in cheese, bacon and green onions and you have a little slice of heaven! I am off to pin and make these SOON! Your potatoes caught my eye right away at the Inspiration Monday link party! They look amazing!! Pinning 😉 Thanks for sharing!! The casserole sounds delicious. Just one question,after I’ve removed the roasted garlic cloves and set them aside, do I just leave them there or at some point will they be included into the recipe? Thanks for asking! The roasted garlic will be added when you mash in the rest of the ingredients. While I mentioned it in the text of the post, I failed to list it in the final recipe. Hope that helps! These mashed potatoes look so perfect! YUM!